Do you know anyone in the Edmonton area who might have a story to share? Let’s pretend that you’ve moved your family to a completely new country– sure, you can get by in the language; however, among the list of challenges you must negotiate as a newcomer, you’re trying to manage the sometimes daunting task of learning how to negotiate the local financial system. It’s not hard to imagine how happy you would feel if, in such a situation, a local staff member came out and worked with you, in your language. Again, maybe you feel comfortable with the language, but what if your spouse doesn’t speak it as well as you do–aren’t you meant to be having these conversations together? The scenario I’ve described–specifically, the role of the helpful bilingual staff member–captures a little bit of what Matthew does every day right here in Edmonton: speaking Mandarin Chinese with some of his clients. But what’s the story here? 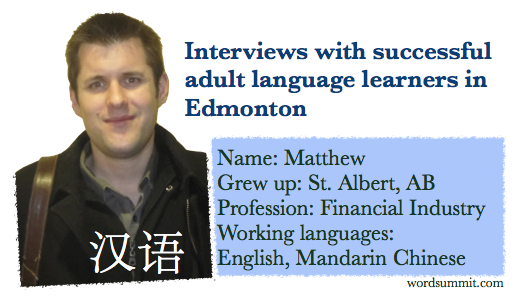 Matthew grew up speaking English in St. Albert, one of Edmonton’s satellite communities–naturally, I was curious to sit down and ask him about his experience of learning Chinese. According to Matthew, his journey began when he was twelve, when he got involved with Tae Kwon Do, “which is actually a Korean martial art–but my teacher was from Hong Kong”. Hearing the teacher speak Chinese from time to time piqued Matthew’s interest, but he never had a chance to do anything about it until he got to University. Fast-forward to the year 2000. Watching TV one day during the summer between his first and second year, Matthew stumbled upon a NFB documentary (Dashan – Ambassador to China’s Funny Bone) about Mark Rowswell, a Canadian who is fluent in Mandarin and wildly famous throughout China. Matthew had originally considered simply taking a couple of Chinese courses to satisfy the language requirement of his Arts degree; however, after seeing how far Mark Rowswell had taken Chinese after not studying as a child, Matthew thought, “if he can do it, why can’t I?”. By the time Matthew graduated with a Bachelor of Arts in Chinese Linguistics and Culture, Mandarin–something that he had originally considered studying “on a lark”–had became a genuine passion. In addition to the Chinese that Matthew learned in University, his HSK Chinese Proficiency Exam score in 2003 earned him a scholarship to study at Nanjing Normal University for the 2004/2005 school-year. Since returning home to Canada, he says his preferred way of continuing to learn is a method that one of his fourth-year professors used to teach a course here in Edmonton. “What she basically did was take an old Chinese movie, 早春二月 (zǎochūn èr yuè) (Early Spring in February), and transcribe every single line in the movie, highlighting some of the grammar points and vocabulary for us. She divided the film into twelve units and we systematically made our way through the whole film over the semester”. While he learned a great deal from that particular movie, after all was said and done with his ‘school’ studies, he decided that what he really needed to do was learn more colloquial speech. To that end, since returning to Canada, he has made a personal project out of studying a modern Chinese dramatic series set in Vancouver, entitled 别了，温哥华 (biéle, wēngēhuá) (Farewell, Vancouver). Just like his old professor, his goal is to essentially transcribe and translate every word in the series, writing down the pinyin of every idiom and trying to find an English equivalent. “Have you ever heard some of the language tapes that some people use to study English?” asks Matthew. “The vocab is great, but real people simply do not talk like that. When people flow with natural English, they drop syllables, consonants and round out vowels— Chinese is exactly the same.” For that reason, Matthew finds that movies and TV shows to be a more authentic learning resource. Matthew says that he enjoys continuing to study in his spare time, and is currently about half-way through the 24-part series of Farewell Vancouver. “You have to understand, when I was studying in China, it was exhausting studying Chinese class all day. When class was over, all I wanted to do was speak English with my Western friends or watch a DVD so I could unwind. Now that I’m back home, it’s more of a hobby that I can enjoy at my own pace. How far do you want to go with your Chinese? Regarding the question of continuing to learn Chinese, Matthew was quick to answer that “it never really stops”. The question, in his mind, is really about the level of intensity that you’re willing to put into it at any given time. For the time being, he has set himself the modest goal of “always being better”. “Don’t get me wrong, if I won the lottery tomorrow, I would go back to school to get my masters in Chinese linguistics”, says Matthew. “But, things being as they are, I have to be realistic and balance my Chinese study with my life, my friends and family–I have courses that I have to take for work and those take time too”. Do you know any successful language learners in the Edmonton area? Just like Matthew, the profile that I’m looking for at the moment is someone who grew up primarily speaking English, started learning another language as an adult, and now speaks the language well enough that they feel confident enough, if the opportunity presents itself, to use it in a workplace setting. Given the amount of diversity in our city, I am confident that Edmonton is home to many successful adult language learners. Perhaps you know someone who learned to speak a new language to communicate with their in-laws, a new neighbour or perhaps a business partner? I look forward to continuing this series as I get in touch with more people. This entry was posted in chinese（中文）, interviews and tagged Adult Language Learners, chinese, edmonton, HSK, mandarin, university, 汉语水平考试 by Wordsummit. Bookmark the permalink.